Search and find out from our online shopping store Ultra-thin Luxury Aluminum Metal Mirror Back Cover for Samsung Galaxy Note 3 by Wholesales-shop that is of imported quality. It is made of high quality metal that is aluminum bumper and acrylic glass back cover that you can be used as a mirror. 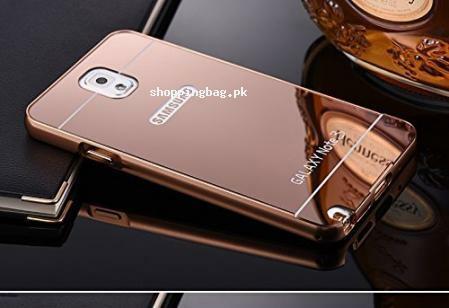 This Ultra-thin Luxury Aluminum Metal Mirror Back Cover for Samsung Galaxy Note 3 is two parts detachable cover case for Samsung online in Pakistan. It will keep your phone trendy and protected in stylish look. It is easy to carry and is comfortable and designed so without adding any bulk. It gives your phone a perfect grip and protects it against accidental drop. Explore the best of online shopping in Pakistan such as; Galaxy Note 3 Case, Samsung Note 3 Case, TIANLI(TM) Luxury Aluminum Metal Bumper, AMCHOICE(TM) Galaxy Note 3 Case, Note 3 Glass Screen Protector, Flower Design Shockproof 3, CelGo Universal Cell Phone Car Mount Holder for all smartphones, mobile phones, iPhone 6 / 6+ and many others. Material:High Quality Metal/Aluminum Bumper + Acrylic Glass Back Cover .You Can Use Item As Mirror . Luxury Air Aluminum Metal Case ,Aluminum Metal Bumper + Mirror Back Case (Two in One) ,There re two parts of the case, Detachable Aluminum Bumper And Acrylic Glass Back .